Lingjuan Wang-Li is a Professor of Biological and Agricultural Engineering Department at North Carolina State University. She began her studies in China with a B.S. in cotton engineering and earned her M.S. and Ph.D. from Texas A&M University in Biological and Agricultural Engineering. She specializes in air quality engineering and animal housing environmental control. Much of her research addresses various aspects of air emission problems associated with animal feeding operations (AFOs). 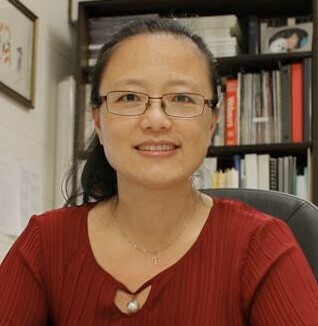 In addition to research, Dr. Wang-Li also teaches an undergraduate course in animal housing and environmental management and a graduate course in “Aerosol Science & Engineering”. Dr. Wang-Li was appointed to the USDA Agricultural Air Quality Task Force (AAQTF) in 2013 and have served on the Task Force from 2013-2017. She was a recipient of a 2010 National Science Foundation (NSF) Career Award in Environmental Engineering. She served as the PI of Southeast Layer Operation for the National Air Emissions Monitoring Study (NAEM) overseen by the USEPA under the “Air Quality Compliance for Animal Feeding Operations. Dr. Wang-Li is a member of American Society of Agricultural & Biological Engineers (ASABE), Association of Environmental Engineering & Science Professors (AEESP), Air & Waste Management Association (AWMA), International Commission of Agricultural and Biosystem Engineering (CIGR). She was the President (2009-2010) of Association of Overseas Chinese Agricultural, Biological and Food Engineers (AOCABFE), the Editor-in-Chief (2005-2008) of the CIGR Ejournal; Chair (2007-2008) of S1025 USDA Multi-State Research Committee on “Systems for Controlling Air Emissions and Indoor Environments of Poultry, Swine, and Dairy Facilities”. Dr. Wang-Li’s research program has been well-funded by USDA, NSF, EPA and industrial sectors in three general directions (1) air quality engineering; (2) animal housing environmental control and management; (3) sustainable animal production and animal well-being. On this page you can find a select list of Dr. Wang-Li’s publication. View a comprehensive listing of grants, peer reviewed journal publications, and conference papers & presentations here. Anhui Institute of Finance & Trade, P. R.
Lingjuan, W. L. (2015), International Journal of Agricultural and Biological Engineering, 8(2), 1–13. Lingjuan, W. L. (2013), In Evaluating veterinary pharmaceutical behavior in the environment (Vol. 1126, pp. 15–39). Wang-Li, L., Li, Q. F., Wang, K., Bogan, B. W., Ni, J. Q., Cortus, E. L., & Heber, A. J. (2013), Transactions of the ASABE, 56(3), 1157–1171. Li, Q. F., Wang-Li, L., Wang, K., Chai, L., Cortus, E. L., Kilic, I., … Heber, A. J. (2013), Transactions of the ASABE, 56(3), 1173–1184. Wang-Li, L., Li, Q. F., Chai, L., Cortus, E. L., Wang, K., Kilic, I., … Heber, A. J. (2013), Transactions of the ASABE, 56(3), 1185–1197. Li, Q. F., Wang-Li, L., Bogan, B. W., Wang, K., Chai, L., Ni, J. Q., & Heber, A. J. (2013), Transactions of the ASABE, 56(3), 1199–1209. This proposed Phase I project aims to develop a low-cost ammonia sensor. The specific objectives are : 1. Determine the sensitivity and limiting noise source for a bare-bones open path detection of ammonia using wavelength-modulated photoacoustic spectroscopy with a near-infrared diode laser. 2. Measure the sensitivity improvement due to adding multipass optics and an acoustic reflector. 3. Determine the performance of the Phase I ammonia sensors in a poultry barn. The primary objective of this research project is to leverage, expand, and commercially apply knowledge derived from previous, ongoing, and presently sponsored air quality initiatives targeting ammonia and particulate emission reduction from livestock and poultry production facilities. These studies will employ a complete integrated systems approach to partition all aspects of nitrogen contribution to ammonia emissions including nutritional aspects (feed formulation and physical attributes), digestive physiology of the animal, gastrointestinal and broiler litter microbiology, production practices including manure and litter waste management, production building design, and emitted air treatment technologies that are affordable. The results of these studies are expected to be novel integrated applications that significantly mitigate ammonia and particulate emissions that are currently impacting the long term sustainability of poultry production in the state and nation. This research will involve an investigation of the effects of various blends of large and small particle sizes of corn used in the manufacture of broiler feeds on feed intake, growth, feed conversion, livability, and gastrointestinal tract function and microbiology. This will be coordinated with an investigation of the interaction of various types of litter and flooring with the digestion and utilization of feed that possesses different physical attributes. This coordinated work will provide a means to develop an optimized physical attribute strategy for the production of broiler feed that will result in lower feed production costs while contributing to reduced ammonia and particulate emissions from broiler facilities. Finally, this work will provide operational support for the continued operation of the Waste Processing and Air Quality/Waste Management R&D Facilities at NC State University. The expected outcomes will include lower broiler feed production and litter costs, more efficient and healthy broiler growth and feed conversion, improved broiler gastrointestinal tract function and health that will lead to reduced emissions of ammonia and fine particle particulates (PM-fine) as well as potential greenhouse gases and odors from broiler facilities that will be readily adapted by the commercial broiler industry on a cost-neutral basis. Animal feeding operations (AFOs), while a vital link in America?s food supply, pose a major risk to the environment. There is a critical need to study the fate and transport of hazardous aerosol emissions from AFO facilities. This will provide a basis for further study of health effects and risk assessment associated with AFO aerosols. The dynamics of animal housing/biological systems make the characteristics of aerosols emitted from AFOs different from other industrial pollutants. Although the science community has a fundamental understanding of aerosol formation, fate and transport, significant knowledge and technology gaps still exist regarding fate and transport of AFO aerosols/bioaerosols. The objectives of the proposed work are to (1) quantify the impact of particle size distribution (PSD) on the federal reference method (FRM) PM10 sampler?s measurements such that it will lead to improvements of the FRM PM sampler measurements for broader applications; (2) characterize the spatial and temporal variations in the physical, chemical, and biological properties of aerosols emitted from AFO facilities such that it will result in improved understanding of the mechanism of generation, fate and transport of those aerosols; and (3) develop an interactive simulation model to predict the fate and transport of bioaerosols emitted from AFO facilities. The proposed work involves theoretical and field experimental studies on FRM PM measurement technique and on the fate and transport of AFO aerosols/bioaerosols. The field study will be conducted on two commercial AFO farms. The proposed work will yield (1) theoretical/empirical models to correct measurement errors of FRM PM samplers caused by interaction of PSD and performance characteristics of the sampler; (2) valuable knowledge on the fate and transport of AFO aerosols and bioaerosols; and (3) Bio-Aerosol Responding/Notifying System (BARNS).